Rescue workers stand by a 45 foot deep sinkhole that swallowed a stretch of street in Mexico City on Sunday. 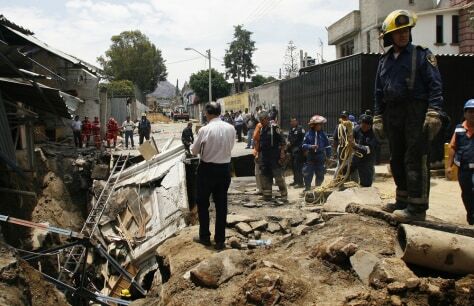 It began as a giant crack late Saturday in the eastern Iztapalapa borough and rapidly worsened when the ground collapsed, swallowing a car, the facade of a one-story brick building and pavement. One man is feared dead.